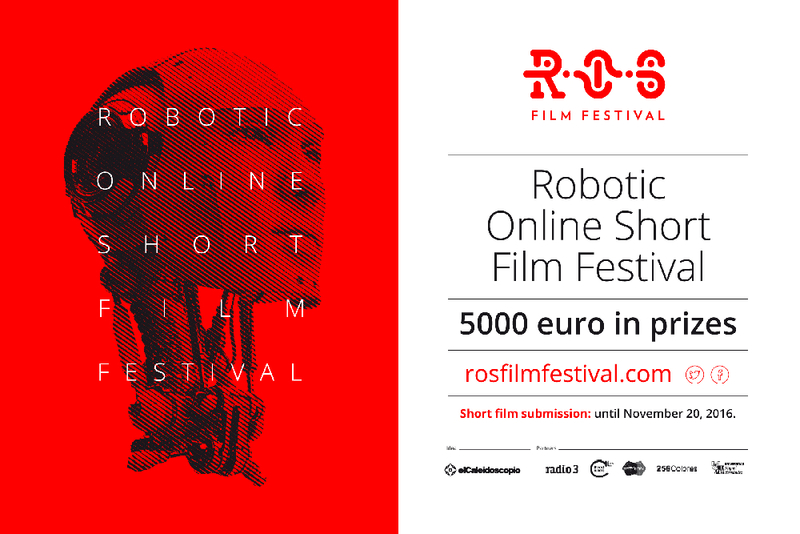 The upcoming Robotic Online Short Film Festival (or ROS festival) is a science fiction short film festival planning to focus on robotics related themes. The deadline for submitting short films is November 20, with films on display from December. We want to create a new space for dialogue between art, science and technology through audiovisual media and around the figure of the robot. The online festival provides a good scenario for promoting social reflection, creativity and artistic work around new realities, as well as opportunities and dangers posed by the technological convergence in which we are immersed. ROS Film Festival has two categories for competition: Fictional Robots, short films where robots have to come to life by usual film techniques (animation, characterization, puppets ) and Real Robots, where the starring robots are robots whose hardware can be handled through software. Our goal is to expand the limits of engineers who work in robotics and artificial intelligence and explore the world of art, cinema in particular. And at the same time, producers and artistic directors will get to know first-hand the potential of current machines, which will at least be useful to inspire their work, or even become a base or a focal point for them. We intend to open a door at the intersection between science fiction and scientific communication, especially by including the category Real Robots as an official section for competition. On the other hand, it is essential to leave the outcome of this intersection available to the general public, for display, interaction, communication, imagination, debate, criticism, and reflection. Under the umbrella of the ROS Film Festival, we would like to develop a network of professionals and institutions in fields related to robotics, cinema, communication, philosophy, art. The ultimate goal of this network is to share points of view from different environments and sensitivities. And so we are launching the ROS Network. Our goal for this symbiosis is that it will lead to mutual enrichment, expanding the views of each of the parties, as well as to a base of knowledge on the evolution of the social imaginary about the human-machine interaction and, in general, on the various utopias and dystopias that technology awakes in today’s societies. To achieve this, we are creating a platform where all members of the network can share their own materials, to give them visibility and movement. ROS Film Festival is, ultimately, a commitment to imagine the future through the potential of technological evolution, the transformative power of art and the reflections and aspirations of humanities. A space where the general public will be able to access, thanks to the expressive potential of short films and the inspiring nature of the figure of the robot, the challenges that robotics and artificial intelligence pose to the future of humanity. We have recently launched our video channel where you can already enjoy some short films out of competition and some interviews with the first members of the ROS Network.